This week's DIY Fashion post is brought to you by MimiG Style Fashion Conference. The conference as a whole was great. I met so many wonderful women and received great tips and ideas. Furthermore, the speakers for each section were great and I've learned things that will help take my sewing to the next level. Let me just say, four years ago you would not have been able to get me to participate in a fashion show. I am an introvert by nature (yes, I see the irony in that when you take my profession into consideration), but I gained strength to fight the urge to crawl in a corner at every social event when I began law school. Needless to say, actually participating in the fashion show was definitely a big deal to this introvert. I can honestly say I will probably never walk down a runway again (my nerves couldn't handle it) but at least I can say did it once. To keep the post short my pattern review for the pants and crop top can be read here and here. I used two of MimiG's video tutorials to create the skirt and bell sleeve crop top, which can be found here and here. I purchased the Waxed Cotton African Print and Geometric Polka Dots on stretch cotton twill from Mood Fabric. 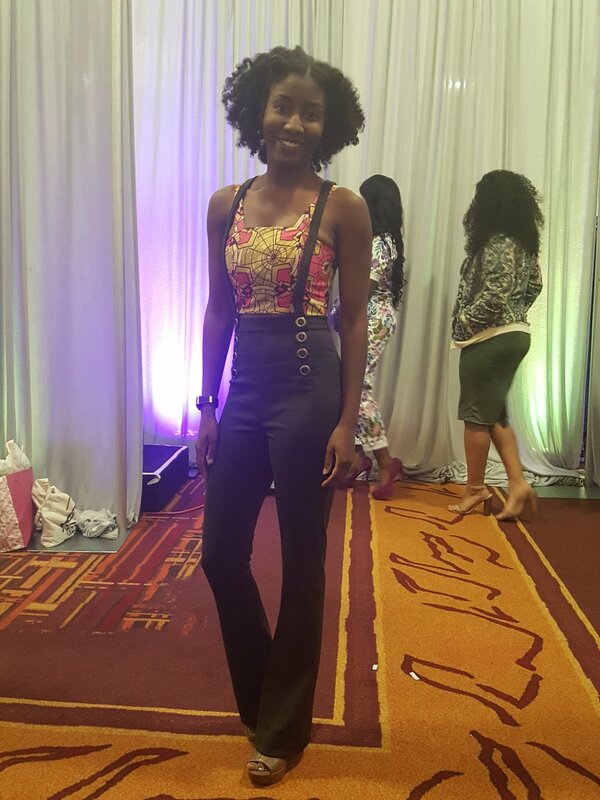 The pants were made using a jacquard double knit from Fabric Mart Fabrics. Fair warning, the stretch cotton twill wrinkles very quickly and I think it is best for garments that fit on the body. This was my first time shopping with Mood Fabrics and I have no complaints. Shipping was fast and the material was exactly as described on the website. I've included a few pictures from the fashion conference and more pictures of the fashion show pieces below. Miss MimiG herself, the amazing Kenneth King, this amazing fabric store, and the beautiful Brittany J Jones. Yes, Los Angeles was great!